ePhotoInc® T Shirt Heat Press Machine 12" x 9" allows transfers graphic T-shirts, garments, bags, mouse mats, jigsaw puzzles, ceramic tiles, plates and other flat surfaced items. Easy to use - Arrives fully assembled and ready to use out of the box. Heat Press Machine is equipped with latest digital Led Temperature and Time Display Controller. Temp: room temp to 500F, Time: 0-999s. When the timer reach 0s an audible sound will alarm this will avoid over heating you projects. Top mounted Pressure knob allows easy access to adjust pressure according to the thickness of the material you are working on. The heating element is Teflon coated - none stick surface will preventing scorching of transfers, and does not require a separate silicone / teflon sheet. * Time signal alarm will sound when transfer done. The pressure can be adjust easily from the top. * Heat Press silicon pad can endure maximum 500 degrees without any distortion. * Printing Area: 12" x 9" * Packing Size: 18" x 14" x 14"
The ePhotoInc® heat press uses heavy pressure and high heat to transfer design onto your project permanently. 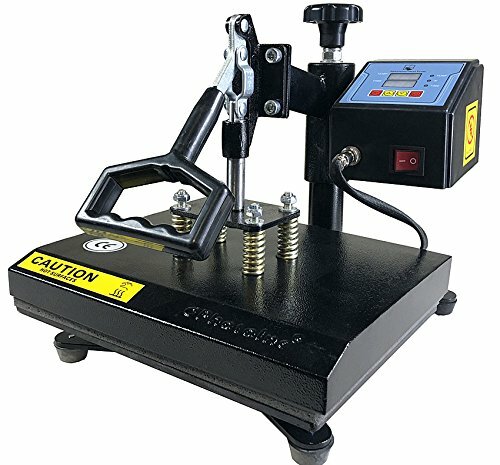 These machines are highly recommended over regular irons since the irons cannot obtain the high pressure and high temperature that a heat press machine can reach and sustain. Heat Press Machine is fully equipped with latest digital Temperature and Time Display Controller, LCD displays show the temperature and time. Temp: room temp to 500°F, Time: 0-999s. The Aluminum heat platen is Teflon coated and the special designed heat platen effectively guarantee the even temperature all around. Heat Press Machine is best for industrial, professional and home use. It is ideal for T-shirts, garments, bags, mouse mats, jigsaw puzzles, ceramic tiles, plates and other flat surfaced items. If you have any questions about this product by ePhotoinc, contact us by completing and submitting the form below. If you are looking for a specif part number, please include it with your message.